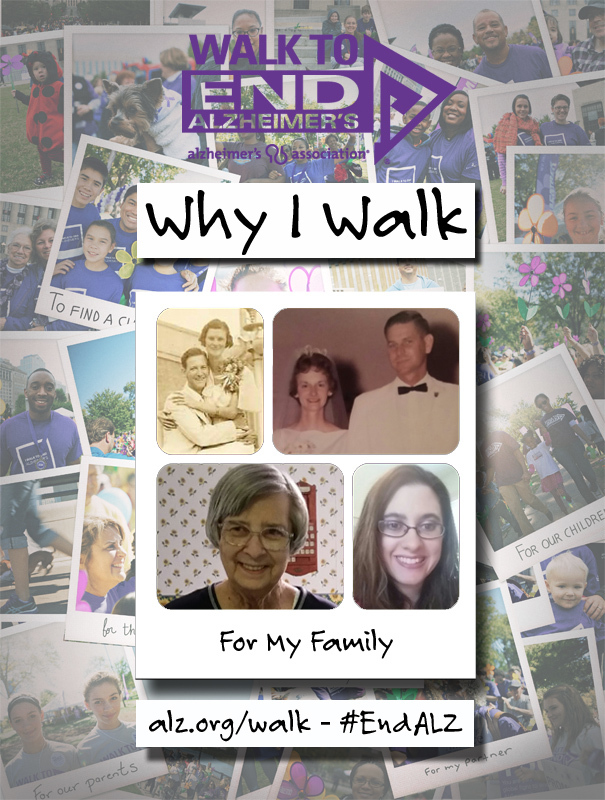 My name is Alicia Miller and I Walk to End Alzheimer’s for four family members – my grandmother, Uncle Johnny, Aunt Loretta and my mother. In addition to the family that I know about, I am also aware that this disease appears to carry further up the line on my mother’s side of the family. I may not know them all, but I Walk for them as well. My first interaction with this disease was when I was a child and watching my grandmother decline over the years. Granted, she had a stroke about the time I was born, but it was Alzheimer’s that ultimately took her life. I watched her physically and mentally decline over sixteen years of my life. Alzheimer’s took away the opportunity to play, bake, talk about things, and just to have a normal interaction with my grandmother. For what I knew of her, she was kind and soft-spoken and she smiled at me often. Being a child and into my young teens, it was scary to watch someone slip away and have conversations with her father (an empty chair to the rest of us), to randomly cry and you didn’t know why, to have no control over daily functions, to hold a baby doll and basically just revert back to being a little girl. She slipped away to heaven in January of 1995. My Uncle Johnny is actually not a “blood” relative but was married to my Aunt Loretta. He lost his battle to Alzheimer’s in March of 2001. Aunt Loretta is currently living with the disease and is my mother’s only, and older, sister. My mother has not been officially given a diagnosis but there is no question to anyone in my family that that’s exactly what this is. We’ve seen and dealt with this tragic disease before. It’s been so much harder now being the child rather than the grandchild or the niece and seeing it firsthand. It’s hard knowing that there are times my mom doesn’t know who I am, there are many times that she’s very difficult to deal with – it’s hard to build a thick skin sometimes and to have to teach your children, nieces and nephews to do the same when they should just be able to be children. It’s hard to watch your mom to repeatedly discover and rediscover the loss of a loved one from almost 30 years ago and to know that I can’t take that pain or those tears away. It can be difficult to repeatedly hear the same conversations and to learn to give short answers, to learn that at times it’s just easier to agree than to disagree, etc. There are so many more things that I could say about my mom, her struggles, and about all that I’ve learned and continue to learn. For those reading this, remember that even through the difficult times, take every ounce of joy that you possibly can out of every moment you can because you never know when it will be their last. Celebrate life, take mental pictures if not real ones, ask questions, build memories and be thankful for all of the little things. Then after you do that, apply those same principles to your everyday life. Cry when you need to, lean on others when you need to, find healthy outlets, seek the Alzheimer’s Association and all of the incredible resources available – that’s what they’re there for. Remember to take care of yourself in the process of caring for your friend/family member. I Walk for my family. I Walk for the caregivers and the amazing things they do every day. I Walk for each person whose story I have seen or heard. I Walk for answers and for a cure and I ask you to do the same. Thank you, in advance, for all of the funds you are raising for research and towards helping families here in the Greater Richmond area. 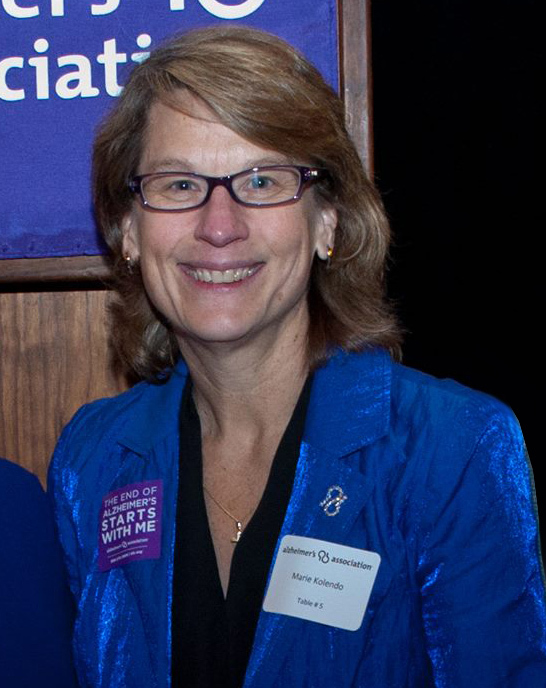 The Alzheimer’s Association Greater Richmond has named Marie Kolendo chief executive officer. Kolendo, who will succeed current Chapter CEO Sherry Peterson, will join the Association on July 27th. Peterson is retiring after serving the Greater Richmond Chapter for nearly 17 years. “As the Alzheimer’s Association Greater Richmond grows to meet the increased demand and needs of those living with Alzheimer’s and their families, we sought a leader with a personal connection to the disease, an individual with a long-standing commitment to our vision of a world without Alzheimer’s, and an individual with a proven track record of managerial and leadership success,” said Andrea Yoak, president of the Alzheimer’s Association Greater Richmond Board. Kolendo served on the Alzheimer’s Association Greater Richmond Board from July 2006 through December 2014 serving the Association in various capacities, including Board Chair and Treasurer, as well as positions with the Finance Committee, Program Committee, and Development Committee. She has also served as the Board representative at the Alzheimer’s Association Delegate Assembly and has been very engaged in advocacy; most recently serving as an Alzheimer’s Ambassador to Senator Tim Kaine. Kolendo spent 16 years at Genworth in various positions; most recently serving as Vice President of Long Term Care In Force Management where she provided leadership in the development and implementation of analytical models to evaluate trends in the Company’s insurance population and identified opportunities to improve performance. Her other positions at Genworth included: Chief Risk Officer – Long Term Care, and Controller – Long Term Care. “I am incredibly excited to join the Alzheimer’s Association Greater Richmond and I am humbled to follow Sherry’s incredible success and to become part of a team that I have immense respect and admiration for,” said Kolendo. Prior to Genworth, Kolendo was controller at Connectool/Paladin Tools and an auditor with Ernst and Young. She received a B.S. in Accounting from Virginia Commonwealth University; an M.B.A. from Averett University; and is currently completing a certificate in Non-profit Management from Virginia Commonwealth University. She lives in Manakin-Sabot with her husband, Wojciech. To learn more about the Alzheimer’s Association Greater Richmond Chapter, please visit http://www.alz.org/grva.